“The Noble Rot sweet white wine is a rarity that can only be obtained every 7 or 8 years. The arrival of autumn in the Finca San Blas, with fresh nights and plentiful dew, covers the plots that are closer to the riverbed with a blanket of fog each morning. This blanket favours the development of Botrytis, the microorganism which produces noble rot. In this way, scents and flavours are concentrated in the grapes, with the help of morning fogs, the evening sun and the development of the fungus over the fruit. The rot doesn’t appear in all the grapes at the same time, so as a consequence the grape harvest must be done in several stages. The grapes were manually harvested in small boxes in November 2013, and the wine aged in new barrels of french oak for 24 months. 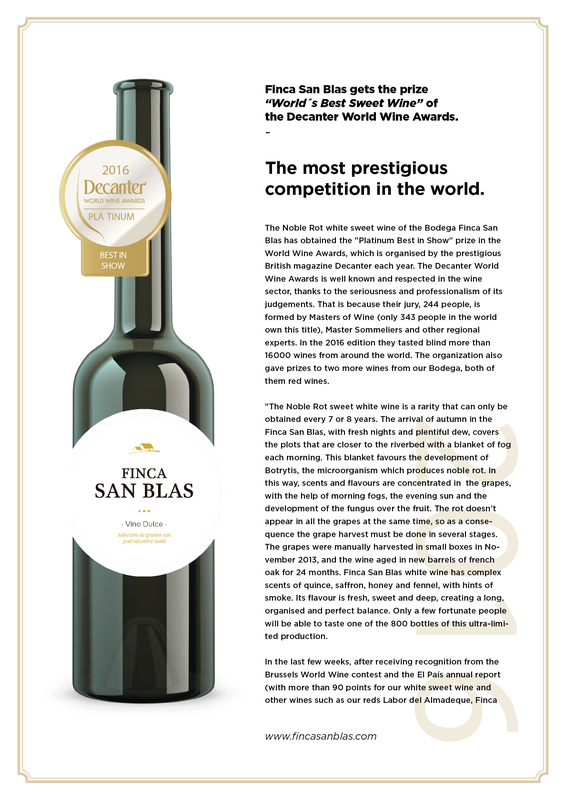 Finca San Blas white wine has complex scents of quince, saffron, honey and fennel, with hints of smoke. Its flavour is fresh, sweet and deep, creating a long, organised and perfect balance. Only a few fortunate people will be able to taste one of the 800 bottles of this ultra-limited production.